Born in London, the son of an industrial chemist and his wife, Rutter grew up living over the Globe pub on London's Marylebone Road. He was educated at Highgate School where fellow pupils included John Tavener, Howard Shelley, Brian Chapple and Nicholas Snowman, and as a chorister there took part in the first (1963) recording of Britten's War Requiem under the composer's baton. He then read music at Clare College, Cambridge, where he was a member of the choir. While still an undergraduate he had his first compositions published, including the "Shepherd's Pipe Carol" which he had written aged 18. He served as director of music at Clare College from 1975 to 1979 and led the choir to international prominence. In 1981, Rutter founded his own choir, the Cambridge Singers, which he conducts and with which he has made many recordings of sacred choral repertoire (including his own works), particularly under his own label Collegium Records. He resides at Hemingford Abbots in Cambridgeshire and frequently conducts many choirs and orchestras around the world. In 1980, he was made an honorary Fellow of Westminster Choir College, Princeton, and in 1988 a Fellow of the Guild of Church Musicians. In 1996, the Archbishop of Canterbury conferred a Lambeth Doctorate of Music upon him in recognition of his contribution to church music. In 2008, he was made an honorary Bencher of the Middle Temple while playing a significant role in the 2008 Temple Festival. From 1985 to 1992, Rutter suffered severely from myalgic encephalomyelitis (ME, or chronic fatigue syndrome), which restricted his output; after 1985 he stopped writing music on commission, as he was unable to guarantee meeting deadlines. Rutter also works as an arranger and editor. As a young man he collaborated with Sir David Willcocks on five volumes of the extraordinarily successful Carols for Choirs anthology series. He was inducted as a National Patron of Delta Omicron, an international professional music fraternity in 1985. Rutter is also a Vice President of the Joyful Company of Singers, President of The Bach Choir, and President of the Association of British Choral Directors (ABCD). The world premiere of Rutter's Requiem (1985), and of his authoritative edition of Fauré's Requiem, took place with the Fox Valley Festival Chorus, in Illinois. In 2002, his setting of Psalm 150, commissioned for the Queen's Golden Jubilee, was performed at the Jubilee thanksgiving service in St Paul's Cathedral, London. Similarly, he was commissioned to write a new anthem, "This is the day", for the Wedding of Prince William and Catherine Middleton in 2011, performed at Westminster Abbey during the service. Rutter's work is published by Oxford University Press. It has been recorded by many choirs, but he conducts his own recordings principally on his label Collegium Records. Rutter's music is eclectic, showing the influences of the French and English choral traditions of the early 20th century as well as of light music and American classic songwriting. Almost every choral anthem and hymn that he writes has a subsequent orchestral accompaniment in addition to the standard piano/organ accompaniment, using various different instrumentations such as strings only, strings and woodwinds or full orchestra with brass and percussion. Many of his works have also been arranged for concert band with optional chorus. Despite composing and conducting much religious music, Rutter told the US television programme 60 Minutes in 2003 that he was not a particularly religious man yet still deeply spiritual and inspired by the spirituality of sacred verses and prayers. The main topics considered in the 60 Minutes programme, which was broadcast a week before Christmas 2003, were Rutter's popularity with choral groups in the United States, Britain and other parts of the world and his composition Mass of the Children, written after the sudden death of his son Christopher while a student at Clare College, Cambridge, where Rutter himself had studied. In a 2009 interview Rutter discussed his understanding of "genius" and its unique ability to transform lives – whether that genius is communicated in the form of music or other media. He likened the purity of music to that of mathematics and connected the two with a reference to the discovery made by the early Greeks that frequencies of harmonic pitches are related by whole-number ratios. Rutter's music is very popular, particularly in the US. In the UK many hold him in high regard, as illustrated by the following quotation from a review in the London Evening Standard (25 September 2005): "For the infectiousness of his melodic invention and consummate craftsmanship, Rutter has few peers". Sue Lawley referred to Rutter as "the most celebrated and successful composer of carols alive today" and Sean Rafferty heralded Rutter as "a creator of not just carols, but wonderfully great things for the human voice." One British composer, David Arditti, did not regard him as a sufficiently "serious" composer, saying that Rutter is "hard to take seriously, because of the way in which his sheer technical facility or versatility leads to a superficial, unstable crossover style which is neither quite classical nor pop, and which tends towards mawkish sentimentality in his sugarily-harmonised and orchestrated melodies." The Guardian remarked that "it is as a writer of carols that he has really made his mark ... His larger-scale works – particularly the Gloria (1974), Requiem (1985) and Magnificat (1990) – are also well established in the choral repertoire." David Willcocks considered Rutter "the most gifted composer of his generation." "The Very Best Time of Year"
A Gaelic Blessing for soprano, alto, tenor and bass voices ("SATB") and organ or guitar, commissioned in 1978 by the Chancel Choir of the First United Methodist Church, Omaha, Nebraska, in honor of minister of music Mel Olson. Gloria for mixed voices with brass, percussion and organ or orchestra. Most of these works are original compositions, including new musical settings of standard texts, whilst others are arrangements of traditional hymns. ^ a b Macfarlane, Alan. "Interview with John Rutter". Archived from the original on 4 March 2016. Retrieved 18 December 2013. ^ Hughes, Patrick; Davies, Ian F. Highgate School Register 1833–1988 (7th ed.). Castle Cary Press. ^ a b "About this Recording". Rutter: Requiem/Anthems. Naxos. 2003. Retrieved 1 November 2016. ^ "Composer of the Week: John Rutter". BBC Radio 3. Retrieved 28 September 2014 – via YouTube. ^ "Welcome To Delta Omicron International Music Fraternity". Delta Omicron. Archived from the original on 27 January 2010. Retrieved 22 July 2011. ^ "News". Delta Omicron. 29 March 2008. Archived from the original on 25 July 2011. Retrieved 22 July 2011. ^ "About abcd". Association of British Choral Directors. Retrieved 7 February 2019. ^ "Order of Service". Daily Telegraph. 28 April 2011. Retrieved 7 February 2019. ^ "Music of John Rutter". Bandmusicpdf.net. Retrieved 7 February 2019. ^ a b Leung, Rebecca (11 February 2009). "Spreading Good Cheer". CBS News. Retrieved 7 February 2019. ^ White, Michael (14 December 2001). "The carol singers' shining star". Daily Telegraph. ^ Blackwell, David. "Meet John Rutter: Touching people's hearts". Rhinegold. Retrieved 7 February 2019. ^ "John Rutter, Desert Island Discs". BBC Radio 4. Retrieved 7 February 2019. ^ "John Rutter, In Tune Highlights". BBC Radio 3. Retrieved 25 March 2016. ^ "Expansive Poetry Online". Expansivepoetryonline.com. Retrieved 28 September 2014. ^ "Sing a song of Christmas". The Guardian. 22 December 2000. Retrieved 7 February 2019. ^ "John Rutter: a Life". Classic FM. Retrieved 28 September 2014. Burrows, Helen Jane (1999). "Choral Music and the Church of England 1970–1995: A Study of Selected Works and Composer-Church Relations". PhD thesis. Norwich: University of East Anglia. Dakers, Lionel (1978). Making Church Music Work. Oxford and London: Mowbray. Frank, Alan (1976). "John Rutter's Partita for Orchestra". The Musical Times 117, no. 1598 (April): 309. Morrison, Richard (1992). "Tis the Season to Be Authentic". The Times (3 November): 29. Westermeyer, Paul (1994). "John Rutter: Popular Romantic". Christian Century 111, no. 35 (7 December): 1158. 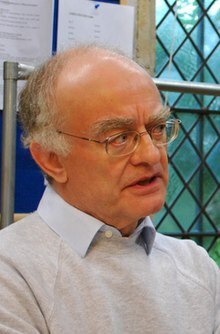 Wikimedia Commons has media related to John Rutter.